Called the “mother of autism,” Isabelle Rapin, MD, died in June at the age of 89. Neurologists she trained with share the role she had in shaping their views and careers in pediatric neurology. Swiss-born child neurologist Isabelle Rapin, MD, who arrived at work to Albert Einstein College of Medicine almost every day for more than six decades, died in June at the age of 89. Formidable in ways that changed the world for children with autism and their parents, her work helped debunk major misconceived notions about the disorder — that it was a single disease, that it was a psychiatric syndrome caused by so-called refrigerator (emotionally “cold”) mothers, and that it could be caused by vaccinations. She delivered more than 550 presentations and invited lectures, as visiting professor, symposium organizer or participant, at universities and hospitals around the world. Her research, lectures, and publications were amplified by the thousands of doctors from around the globe that she taught and mentored during the course of her career. Dr. Rapin was a behavioral neurologist before the term was coined. And her science of autism would become the foundation for the field. She published a paper parsing the contributors to the “autism epidemic” in Neurology just a month before her death from bacterial pneumonia. Her family is working to publish her next manuscript on why congenital blindness might cause autism, and what this implies about brain development and organization. Dr. Rapin met and married her soul-mate, Harold Oaklander, during her first year at Einstein. Together they brought four children into the world in the space of five years while she was building her career. The concept that professional women could “have it all” would not emerge for another half century. She was the first female faculty member at Einstein, and she was its longest-living member. She had no interest in working anywhere else. Her interest in the human brain was so profound that she arranged an academic autopsy after the death of her brother, a mathematics professor in Switzerland, and brought his brain to the Bronx where she supervised Einstein pathologists to study its delicate tissues. From this, they published the first known neuropathological study of Asperger syndrome. She so enjoyed accompanying her daughter Anne Louise Oaklander, MD, FAAN, a neurologist at Massachusetts General Hospital (and a member of Neurology Today's editorial advisory board), to their renowned brain cutting conference, that she left instructions that her own brain and spinal cord be studied there as well. Isabelle Rapin was born and raised in Lausanne, Switzerland. Her father was a university professor of English literature. With his wife, an American who graduated from Vassar before her married life in Switzerland, they raised their three children as dual citizens who were fully bilingual in English and French. All would go on to graduate degrees in science and math. Summers with her mother's Connecticut family encouraged Isabelle to seek professional opportunities in the United States after she completed medical school at the University of Lausanne. In 1958, Albert Einstein was a newly-minted medical school in New York, and the dean wanted to create a pediatric neurology specialty. Dr. Rapin, well trained in both specialties, was the obvious appointment. She was interested in communication disorders, particularly the congenital deafness caused by in utero exposure to rubella, and she pushed the then-radical idea that early diagnosis and intensive education could prevent or ameliorate the mental retardation and disability that were felt to be inevitable at that time. Her insights took hold and helped to end the routine practice of institutionalizing and segregating the deaf. For years, she treated children and taught at St. Joseph's School for the Deaf to help deaf children acquire language by other means, including sign language, which improved their brain development and their futures. Her protégé, Oliver Sacks, credited her with developing his interest in the senses and later dedicated his book The Mind's Eye to her. “Her deep caring, intellect and thinking about patients and their issues is what made her such a force in the field,” said Daniel Geschwind, MD, PhD, endowed professor of neurology, psychiatry and human genetics at University of California, Los Angeles. “She is one of the last of a generation of great clinician-scientists.” Dr. Geschwind and his colleagues started a bi-annual course on autism at Cold Spring Harbor Laboratory and asked Dr. Rapin to give an introduction to the history of autism. Roberto F. Tuchman, MD, FAAN, met Isabelle Rapin in 1986 when he was considering Einstein's child neurology program, and she went on to become his mentor there and lifelong friend. He loved rounding with her. “She would discuss a case and rattle off a differential diagnosis and a possible pathology and link everything she was saying back to the behavior and clinical symptoms. She was beautifully descriptive.” Dr. Tuchman created a database of all of the autistic patients she had seen at Einstein. “I would read her notes and I could almost see the patient before me,” he said. This database, and the videos Dr. Rapin would take of the children, led to many insights about the road to autism. They had many prominent visitors at Klinkenberg, including her close friend Oliver Sacks, MD. In addition to her commitments to patients and her family, she found time for organizational and administrative leadership. The first director of pediatric neurology at Einstein, she helped launch the International Child Neurology Association. She served on study sections of the National Institutes of Health, and then as a member of their National Advisory Council, a position now held by Dr. Oaklander. The AAN celebrated her achievements with the President's Award in 2010. She became the first vice president of the American Neurological Association in 1981. She had won the International Society for Research in Autism Lifetime achievement award. A decade ago, Dr. Tuchman saw his mentor at the International Society for Autism Research. “You know,” Dr. Rapin told her friend, “I am the oldest person presenting a poster here.” Indeed, she was almost 80. (Her husband, almost 96, still teaches a program on unemployment that he founded at Cornell University while in his 80's.) Dr. Rapin would officially retire in 2012 at the age of 84, but she never stopped working. For the past several years, scoliosis was the only thing that kept her down. “I became her wheelchair without wheels,” said her husband. 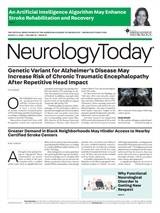 Neurology Today17(13):8-9, July 6, 2017.